Good n ews for developers who are migrating to the Twitter API version 1.1. You now have until June 11 to make the transition. After that, it’s lights out for any application still running on v1. The original retirement date for v1 was May 7, but Twitter postponed that date to accommodate more blackout testing. Blackout tests allow developers to see how their application will look once Twitter turns on its new API. Twitter says it wants to give its developers ample time to make the switch so that everything goes smooth. In the past, developers could access the Twitter API anonymously and display Tweets anyway and anywhere they liked. 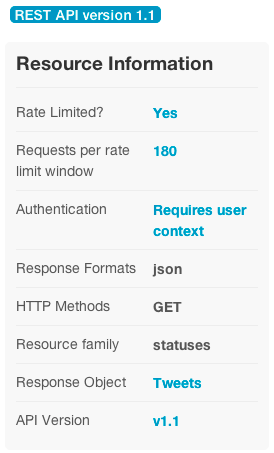 Now all Twitter API requests must be authenticated via OAuth. Intended to eliminate malicious use of the API, this step also enables Twitter to get a better understanding of the apps using its API. Twitter API v1 gave users a flat rate of 350 calls per hour, regardless of the type of information the app was requesting. Now Twitter is setting up a sliding scale. Applications with one endpoint now have 60 calls per hour while others will have more. Developers with third-party client Twitter functions (think Tweebot) will have a 100,000 user limit. If an application already has over 100,000 users, Twitter will allow the developer to maintain the application until it reaches 200 percent of its current user token count. Once those ceilings are reached, developers have to work with Twitter directly. Essentially, Twitter doesn’t want a third-party to build an app that mimics the core Twitter experience. Twitter will no longer support RSS, XML and Atom in favor of JSON. One of the uses of RSS was for a user to display a stream of tweets on a website. While that capability is now gone, v1.1 includes a Twitter-approved widget that enables developers to embed timelines of Tweets on any website. Timelines are collections of Tweets, ordered with the most recent first. Some of the new rules in v1.1 have fired up controversy. Many social media developers feel Twitter is creating too much restriction over pulling data. Time will tell how the update is taken in by the crowd. But for now, at least, developers have a few extra weeks to comply with the new requirements.